Expectations from fans plummeted when QB Ryan Tannehill suffered a season-ending knee injury in training camp and the team ultimately struggled to a 6-10 record in 2017. There were some positives for the team despite the rough year, most notably the emergence of running back Kenyan Drake down the stretch. Defensive tackle Ndamukong Suh had another monster season leading the defense and safety Michael Thomas was PFF’s Special Teams Player of the Year. With more stability at the quarterback position given the presumed health of Tannehill and more emphasis placed on improving the interior offensive line, the offense should bounce back well enough to keep the Dolphins in playoff contention throughout 2018 as the defense continues to improve. Landry has been one of the most productive wide receivers since entering the league. The former LSU star leads all wide receivers with 267 receptions and 2,880 receiving yards from the slot since 2014. He has also shown the ability to make defenders miss in the open field, as evidenced by his 65 forced missed tackles over the last three seasons, good for second-most in the NFL. One knock on Landry early in his career was that he was not a red zone threat, however, he has generated a passer rating of 124.1 on his targets inside the 20-yard line over the last two seasons, the second-best mark among wideouts with at least 25 red zone targets in that span. Landry has graded out at 80.9 or better in each of his first four seasons, finishing 2017 ranked 19th out of 116 qualifying wide receivers overall. Teammates DeVante Parker (73.1) and Kenny Stills (49.0) disappointed and no other wide receiver on the roster played more than 144 snaps, making the need to re-sign Landry imperative for an offense that is lacking playmakers. Norwell finished the 2017 season as our third-highest graded guard overall at 88.8 and No. 1 in pass-blocking at 90.9. The former undrafted free agent out of Ohio State has been consistently good in each of his four years in the league, grading out no lower than 82.8 since 2014. The Dolphins have neglected to address the guard position despite it being a glaring weakness on their roster for years now. The highest of their three qualifying guards in 2017 was Jermon Bushrod, who finished 62nd out of 77 qualifying guards with a 40.3 overall grade. Norwell would make an immediate impact as the team’s best offensive lineman in both the running and passing game. If the “dream splash” of Norwell were deemed unattainable, settling for Pugh wouldn’t be a bad consolation prize. The 27-year-old battled injuries in 2017, playing just 436 snaps and grading out at 52.4 overall. His 2014 and 2015 campaigns (84.5 and 81.2 overall grades, respectively) were more indicative of the type of player that Pugh is. In Miami, Pugh would fill a huge void at the left guard position and would help shore up the interior offensive line from Day 1. His experience playing both the tackle and guard positions at a high level provides extra incentive for any organization needing help up front to take a closer look at him. Head coach Adam Gase’s offenses are playing at their best when they have playmakers at the tight end position. Julius Thomas had the best two seasons of his career when Gase was his offensive coordinator in Denver (82.3 in 2013 and 79.8 in 2014). Tight ends Zach Miller and Martellus Bennett combined for 87 receptions, 878 yards, eight touchdowns and 19 forced missed tackles with Gase in his lone year with the Bears in 2015. Playing behind Zach Ertz has limited Burton’s role with the Eagles over the years, but he’s made the most of his opportunities when given the chance. He finished the year ranked 10th out of 56 qualifying tight ends with a 74.5 receiving grade and scored five touchdowns on just 33 targets for the season. 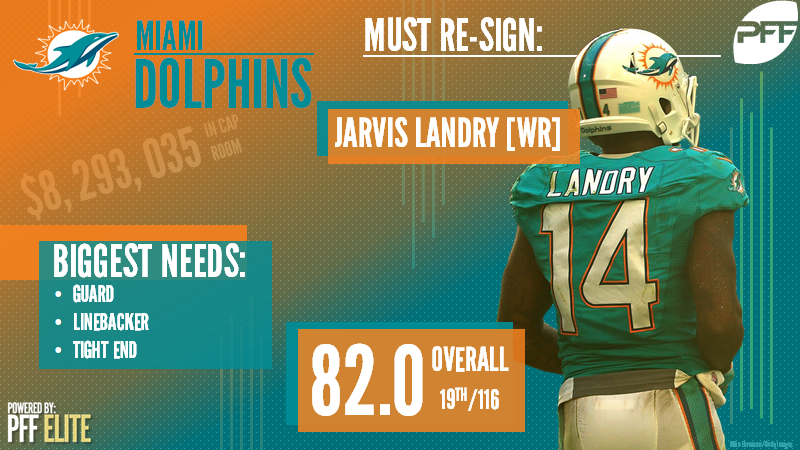 His ability to stretch the field from the tight end position would bring a new dimension to the Dolphins offense they have been lacking for years.